snowdeal.org > ex machina: the eric update - day 1192: odin the artist works the easel. the eric update - day 1192: odin the artist works the easel. odin has been enjoying his new easel ( ikea strikes again! 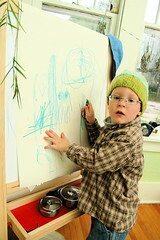 at $29.99 the MÅLA is much more affordable than anything else we could find and includes a whiteboard and chalkboard. ) and if you drop by for a visit he might excitedly ask you to watch him as he works his artistic magic ( at this moment, he's rendering an abstract impression of the silver pots sitting in the paint/marker/chalk holder ). and yes, his most favoritest hat ever - handcrafted by his mamma - is back on his head. i'll be suprised if we get him to take it off before spring.